Immaculate were appointed to assist SPORTSDNA to develop brand identity and communications collateral to launch and position their new business venture. 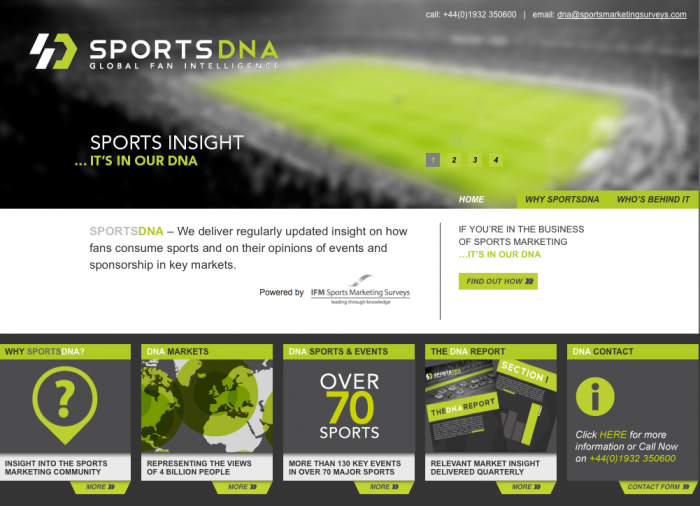 Part of IFM Sports Marketing Surveys, SPORTSDNA deliver regularly updated insight on how fans consume sports and their opinions of events and sponsorship in key markets around the world. Providing full service capabilities including media analysis, market research and consultancy – IFM Sports Marketing Surveys are pioneers in sports marketing and sponsorship research as the first entrants to the marketplace in 1984. Part of RSMG Insights since March 2012, IFM Sports Marketing Surveys have a global network of more than 1,200 employees in 20 international offices worldwide and are currently working with clients in over 170 countries.